Creamy, rich, and full if curry flavor, Curried Deviled Eggs look like your typical deviled egg, but pack a flavor punch. Your Easter guests will want the recipe! It’s the last day of Easter Week! I hope y’all enjoyed our recipes. Some of them look scrumptious and will be going on our menu this year. 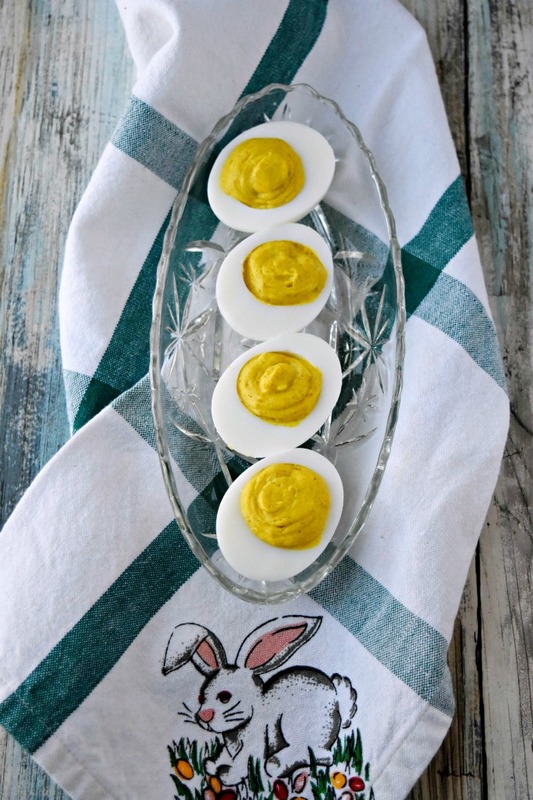 I may even make curried deviled eggs again for our Easter. They were delicious! Besides, it’s almost a requirement to have deviled eggs for Easter isn’t it? I mean my sister and I were growing up, we would dye probably close to if not more than 2 dozen eggs. Of course, I’ve talked about the special color eggs neither of us remembered dying but always wound up finding the next morning. It was a great way our parents kept the Easter Bunny tradition alive. That’s a lot of eggs for just 2 kids and 2 adults. What’s a family to do with all those eggs? Make deviled eggs! Yes, or egg salad, but there’s really only so much of both one can handle after a week of eating them. What else can you do with hard boiled eggs? There has to be something else to make with them. Maybe I’ll share what I find next year for Easter Week. Anyway, since we don’t have kids we will not have a ton of hard boiled eggs for Easter. And that’s okay. I’m okay with that. It just means I’ll have to boil a requisite few to have some of these curried deviled eggs again. Or maybe I’ll make the red white & blue deviled eggs or the Middle Eastern deviled eggs. You know, I do have some za’atar to make those again. They were so good. Yeah, I don’t know why I keep wanting to go the Middle Easter or South Asia for my eggs. I guess it’s because I love all those spice mixes. I mean, I could eat my weight in curry if it’s a good curry. Or the crack chicken, but I haven’t been able to get more of my friend’s masala. Man that stuff was amazing. And I don’t see that I shared those. Hmm… Oh well. I first had curry when I was 9 or 10? I think? Don’t quote me on that one. I remember sitting at the table not knowing what was in store for me. They brought out papadams; which are this crispy and delicious chickpea flour bread for lack of a better work. They were so delicious! Then they brought out the curry and the basmati rice. The toppings ranged from chopped onions and jalapenos to golden raisins and coconut. Really? Raisins and coconuts? And peanuts? Yes. You must try them all on your curry. Ever since then, I’ve been addicted to curry. I even shared a post about the curry mix we use at home. It makes cooking up a good curry super easy and delicious. Of course, in India I don’t think they call it curry. I think that’s the more Americanized version. I think they call them gravies or masalas. Because curry is like calling it chili. There’s so many different flavors and tastes to chili that you can’t really just call it chili. At least that’s my interpretation on it. And masalas are such a family recipe and regional blend that there could hundreds if not thousands of variations. And no, not all curry is spicy! I’m in the process of trying to figure out what type of curry mix I want to make for our family. I like a rich blend that is not too peppery but has more of the aromatics of fenugreek and cardamom. But I have to be careful with cardamom. The hubs isn’t a huge fan of it. These curried deviled eggs have my own masala blend in there with a mass produced curry powder. I mean, I have to have something in the meantime while I figure out what curry blend we’re making. A hoor has to get her curry fix somehow! I would love to continue Saffron Fix, but it’s pricey for us now, and, well, the hubs isn’t a huge fan. But he was a fan of these curried deviled eggs, that’s for sure! They’re creamy and rich with that curry flavor throughout. You could easily garnish them with cilantro (blech) or top it with a little more curry powder or even a sprinkling of poppy seeds would be nice. Which I didn’t do. I really should garnish more. Have you tried curry? What about curried deviled eggs? Make sure you check out what the rest of the bloggers are sharing for our last day of Easter Week! We hope you’ll pin and share them all, and make a few of the recipes, too! I highly recommend these! They will vanish! Slice each egg in half lengthwise and carefully remove the yolks. Place the yolks in a mixing bowl and add the mayonnaise, curry powder, garam masala, salt, and pepper. Mash with a fork until smooth. Using a spoon or a piping bag, fill the egg white halves. Garnish with curry powder or fresh, chopped cilantro and serve. Love the curry flavor addition. My life would be very sad without deviled eggs…these could make a very happy girl!!! I agree! Deviled eggs are required. I LOVE deviled eggs and can you believe it, I’ve NEVER made them! I need to make these happen for Easter! Oh my gosh! They’re so easy!! You really should make them. I do like curry but never thought to add it to my deviled eggs. Great idea. Thanks again for all your hard work this week. Thank you for participating, Wendy! I try to add curry powder to almost everything. I’ve never made (or even eaten!) a deviled egg before. Must change that! How is that even possible? They’re so good. You should try them. If you like egg salad, you’ll love deviled eggs. Oh my goodness these sound extraordinary!